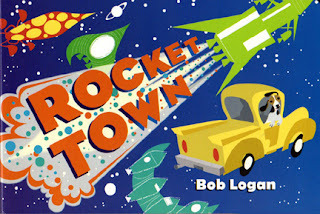 Rocket Town by illustrator/author Bob Logan, $7.99, Sourcebooks. What a perfect book to be reviewing, just as the U.S. space shuttle program is coming to a close with the return of the Atlantis Space Shuttle. By way of introduction, Bob Logan is a Southern California illustrator and artist. Recently he appeared and read Rocket Town live at the Los Angeles Times Festival of Books an event my own family loves attending each spring. Logan is also the author of another cute young children's title called The Sea of Bath. From a mom perspective, I know this book is really meant for today's toddler. But I have to admit it's got magnetic old-fashioned appeal to baby boomers like me, too, because of the retro pop art style and storyline. In fact, it seems to bridge time. It's a celebration of the pre-shuttle days, ala The Jetsons family, the TV cartoon series from the 1960s that I grew up with, as it is much in tune with the modern times we live in today. In this tale an astronaut, along with his doggie friend, venture off in a bright yellow pickup truck that might have time traveled right out of the mid 1950s. Their destination is Rocket Town and along the way they'll pass every imaginable kind of rocket and space craft in search of the one they like most. The different rockets are big and small, in all kinds of shapes. Care for a shark-shaped rocket? That is only the beginning of all you will see in this book. For sure, you never know what you'll find on the next page! Finally, this unlikely duo finds the perfect rocket ship for their journey into space. You and your child will laugh together as you discover that this rocket actually looks just like their pickup. Then, together you'll count down and blast off at the end of this charming story. The colorful pictures throughout this sturdy board book are sure to inspire little kids' imaginations to reach for the stars -- figuratively and literally. Whether Dad, Mom, Grandma or even Great Grandpa is reading this to a lucky child, it will certainly delight multiple generations. FTC Disclosure: I received a copy of the book to facilitate this review. I did not receive any payment or other compensation associated with this post. See complete FTC Disclosure information that appears at the bottom of MommyBlogExpert's main page and at the bottom of every individual post on this blog, including this one.